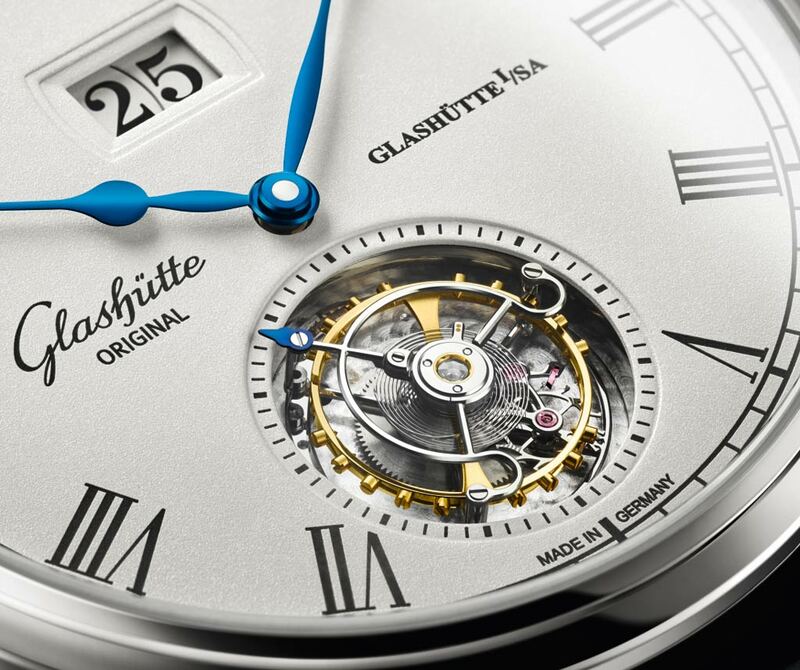 Glashütte Original presented a new version of its Senator Tourbillon in a white gold case framing a light, silver-grained dial whose finely textured surface clearly sets off the black laser engraved indexes and railroad chapter ring. One of the most appreciated horological feats, the tourbillon (French for whirlwind) was originally developed by Abraham Louis Breguet in 1801 to compensate for the effects of gravity on the rate precision of mechanical pocket watches. The ingenious construction compensates for the centre of gravity fault resulting from the vertical position of the watch by causing the entire oscillation and escapement system to turn on its axis once a minute. 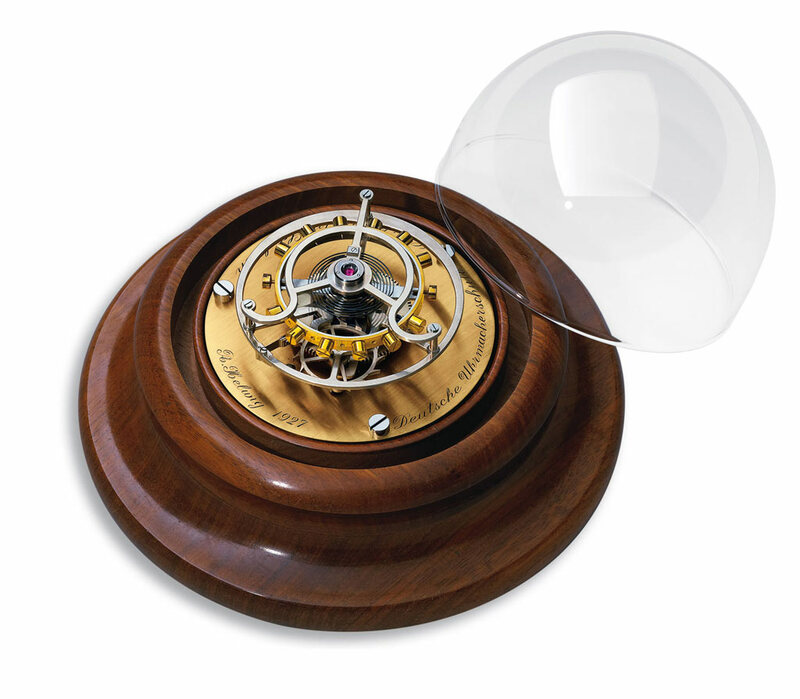 In the era of pocket watches the tourbillon was a revolutionary invention and a guarantee of precision. In order to see a significant improvement to the tourbillon invented by Abraham-Louis Breguet, we had to wait more than a century when Alfred Helwig, master watchmaker and instructor at the German School of Watchmaking in Glashütte, designed the first flying tourbillon in 1920. 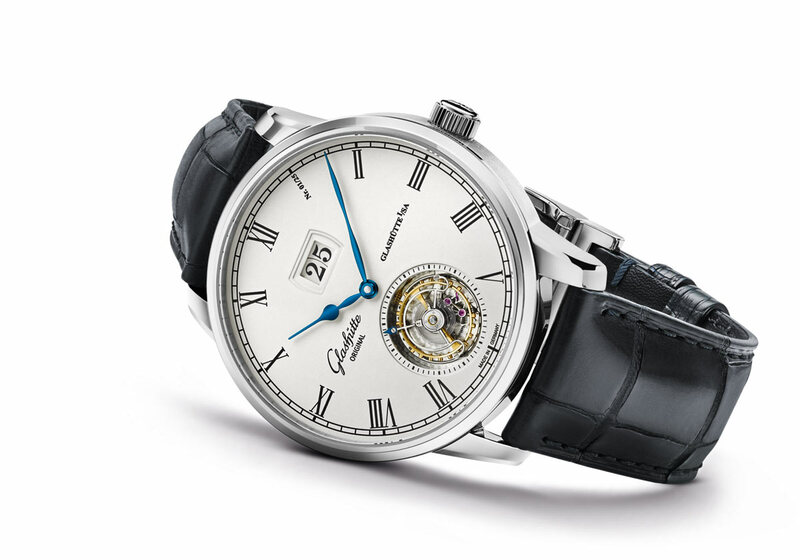 Rather than being supported by a bridge on the dial side and a bridge on the movement side, the flying tourbillon is cantilevered, i.e. is only secured to the plate on one side so offering an unobstructed view of the mechanism on the other side. 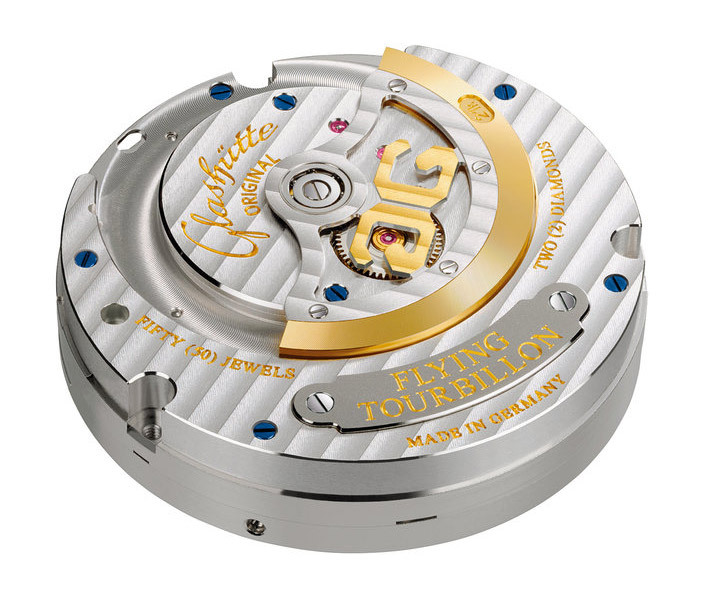 The development of a flying tourbillon is particularly challenging because a revolving carriage that is not supported at both its extremities needs a perfect balance of all axes as they relate to one another. In case of the Senator Tourbillon dedicated to Alfred Helwig, the tourbillon exposed at 6 o’clock is powered from the third wheel to the fourth, which is mounted below the tourbillon and secured in the tourbillon assembly. This way, the movement of the balance and cage can be admired without interference from a top bridge. The lightness of the construction is simply amazing: in fact, this flying tourbillon, comprised of 72 finely finished components, weighs only 0.2 grams! 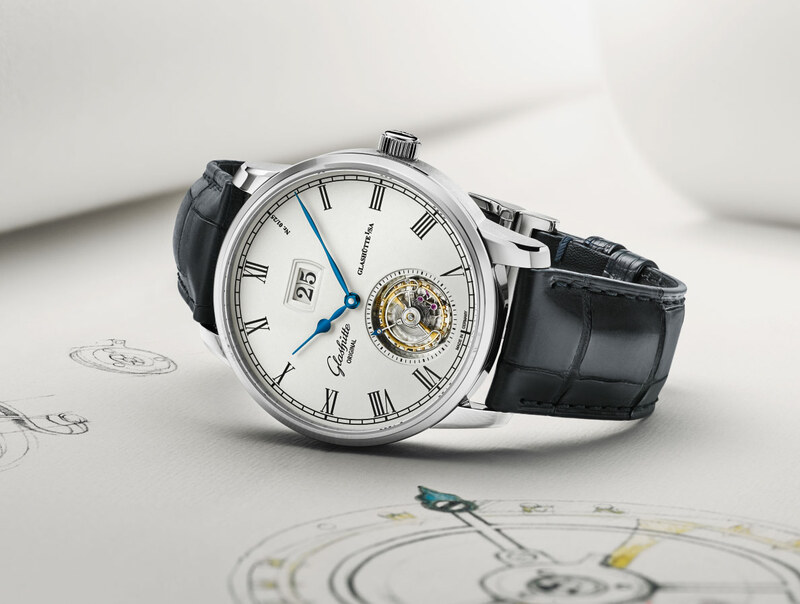 The beauty of the tourbillon is visually balanced, at 12 o’clock, by the Panorama Date. The arrangement of the two date discs on the same level without a central separation bar enables the smooth appearance of the date in its large window. Water resistant to 5 bar, the 42 mm x 13.7 mm white gold case houses the manufactory Calibre 94-03 automatic movement beating at a frequency of 3 Hz (21,600 vph) with a 48-hour power reserve. 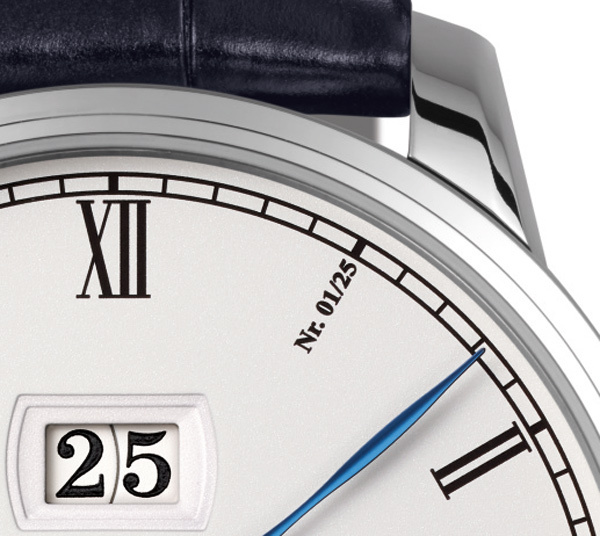 The individual numbering of this 25-piece limited edition is elegantly revealed by the Roman “index” at 1 o'clock. Like the idea to have the individual numering in place of the I numeral. A classy detail in a perfect watch. Glashütte Original Senator Tourbillon, Edition Alfred Helwig; Glashütte Original presented a new version of its Senator Tourbillon in a 42 mm white gold case framing a light, silver-grained dial whose finely textured surface clearly sets off the black laser engraved indexes and railroad chapter ring. 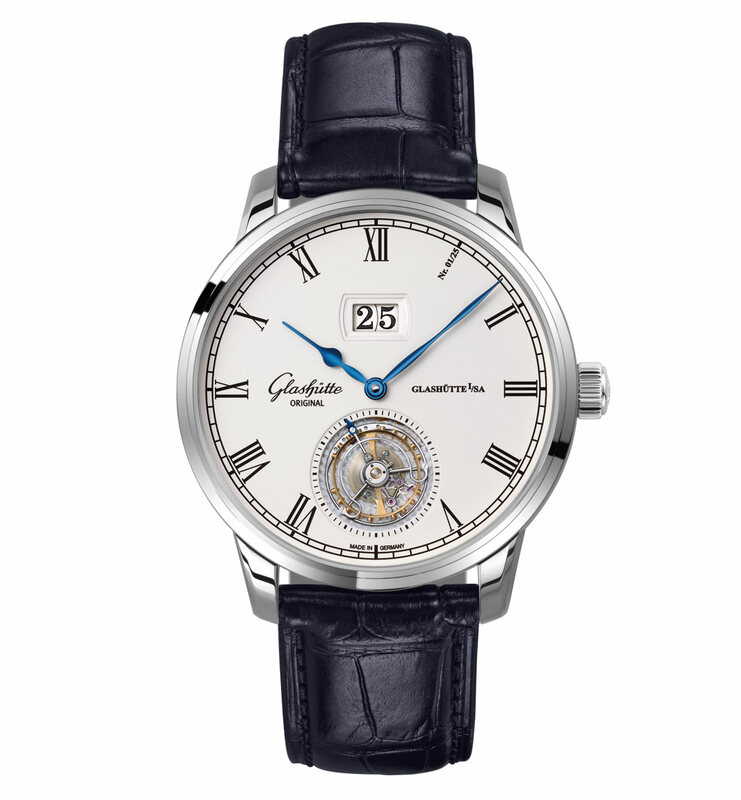 A black Louisiana alligator leather strap with white gold foldover clasp secures this exclusive timepiece to the wrist. 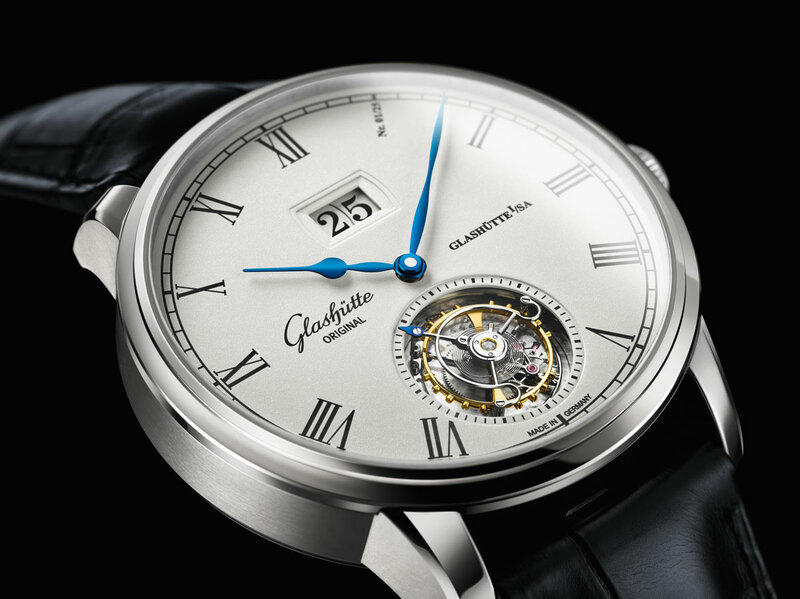 The price of the Glashütte Original Senator Tourbillon Edition Alfred Helwig (ref. 1-94-03-05-04-30) is around Euro 100,000.